Nice that you got that personal autograph! Christopher Priest seem to float around a lot, so him not being a mainstay on one book isn't too surprising to me. Thanks! And yeah, he seems to write what he pleases. He's a talented man, and I hope we are him return after he's done. Still looking forward to his run big time! It looks like most creators are signing on for 2 volumes. Which is fine. Allows for a nice storyline and then opening it up for new voices. I talk to Amy, she said he signed on for another "season" so I think they actually have them have a contract every volume, maybe. I like the same writers and artist on titles for a good long while. But that's just my opinion. I can see how a fresh voice can help sometimes haha. Also, I made a Facebook page guys! Sometimes it easier and fast for me to post news there, then later in the day here (like during cons) I also think it's just cool to get to know each other more. Feel free to join! I did one of these for Project Black Sky and Dark Circle, and they can get pretty popular as not every has a CBR account haha. Two amazing Catalyst Prime titles come out tomorrow! Something is affecting his powers leaving him vulnerable. Althea Morrison comes to the shocking conclusion that the Stream reality Daniel finds himself in when he runs is, in fact, killing him. As Magnus's journey continues, he finds himself at a crossroads between his old life and the new one he envisions for himself. With his mother, Olivia, out of commission due to a sudden illness and his brother, Drew, locked away for his crimes, Magnus has been forced to do the one thing he never wanted to do: be the CEO of AtiSat Corp. More invested in the expansion of his paranormal abilities, Magnus sees a future for himself that does away with the shackles of his current reality. 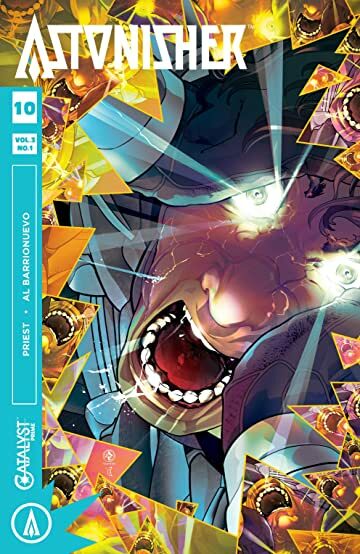 I'm really looking forward to the new Astonisher! Last edited by Power Torch; 09-11-2018 at 08:06 PM. Have I mentioned how much I love these freakin' Accell covers! 'Cause I freakin' love these Accell covers! The artstyle of the book is so much fun! It reminds me of the indie comics scene from the late 90's and early 00's! I love that kinetic and energetic aesthetic! Bad guy looks boss once again, too! "It's fun and it's cool, so that's all that matters. It's what comics are for, Duh." Doesn't Quincredible take place in the CPU but is under the Roar Banner? Yeah that’s exactly it, cause I’ve heard it mentioned under the Catalyst Prime Banner. How much it will connect with everything else, we have to wait and see. I might skip on Quincredible. Not sure. I wanna say give it a shot. At least to get a more concrete bearing. Yea. least give the first volume a try. There is suppose to be an upcomming crossover event right, maybe early next year? I think it's time some of these characters meet up, only Lorena seems to be appearing in various books. David needs to meet Val, the fomer crew mates will have a lot to talk about. Or Accell needs to meet the Incidentals crew since they are all in L.A.
Yeah, I saw them post this. Was going to wait till I felt better to share. Glad you beat me to it. Shame no cover for Summit though haha. If anything it may cross over with Superb, which is also now under the Roar inprint, I believe (if I remember SDCC right haha). Personally, I'm looking forward to Quincredible, it will be nice to get a new title! Yes, there's an event planned for early 2019, we can actually time it, based on what the Incidentals writer said. He said after the next story arc ends it leads right into the event. So my guess is in April maybe? Gail gave a hint that was basically that we're being watched, so I'm interested to see where that leads (aliens, is my guess). Personally I can't wait for David and Val to realize that most of the team that went up there is alive haha. Looks like the next arc in Summit has to do with the event, so maybe we will see it sooner then later. Also, sorry I've been missing for a few days, I haven't even read the new releases yet (my store didn't have them yet, something to do with the storm, maybe?) I'm also very sick from Chemo, which has set me behind. Hard to focus haha. (Don't worry, I'm fine. Two more rounds of Chemo, then I'm done. Not going anywhere haha). Once I catch up I'll post my thoughts. Quincredible looks like he could do some parkour. From what I understand regarding the initial concept, Quin's power is invulnerability, but that's it. So to compensate for that being the limits of his power, he has to learn and train to move and fight "like a normal." This would indeed include athletics like parkour. Kinda like Luke Cage Jr.
As far as I know, Luke Cage has more than just invulnerability. Luke also has super strength and other enhanced physiological capabilities. He's also sturdy on top of being invulnerable, meaning he can "no sell" things and can't be knocked around easily, if at all. Quin is simply invulnerable, that is, he can't get hurt. And that's it. Unlike Luke, Quin could easily be thrown around like a rag doll. He wouldn't get hurt, but he could still very easily get pushed around and overpowered. Part of Quin's challenge, as well as the allure of the character. is that even though he can't be harmed, he is still otherwise the same "wimpy teen" that he was prior to obtaining his invulnerability (his invulnerability didn't come with any other perks or "required secondary powers"), and so he has to overcome that limitation and learn new hard skills in order to become an effective hero. Last edited by J. D. Guy; 09-20-2018 at 10:49 PM.